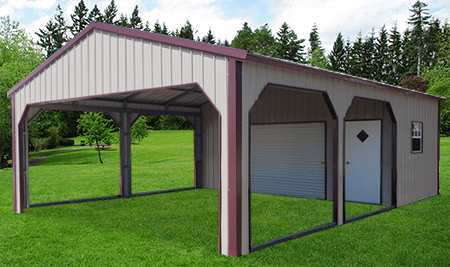 The Elite Utility Carport goes above and beyond to store your boats, tractors, 4-wheelers, or other small vehicles with a modern, more sophisticated style. This option includes a 10-foot deep closed section at the rear for additional storage, a 9 lite vinyl door and 30″ x 30″ window and 45 degree trim on all openings. Maximize your storage capabilities, and keep your vehicles running strong with our Elite Utility Carport. Not all structures meet codes. Engineering plans available upon request at an additional cost to the customer. Truss is required on all units 26′ or wider. Price of truss is included in base price shown. Please ensure that the site is level. Site preparation is critical. If your land or site is not level and ready when the crew arrives, additional labor costs may be incurred, and/or a restocking fee will be applied. There will be some projects that will require a lift to be ordered. This must be paid separately from the sales order.